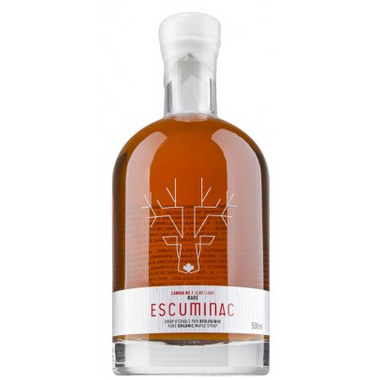 Escuminac Extra Rare maple syrup is produced in very small quantities, making it rare. Golden in colour with bright highlights, it is the finest in our range. Produced exclusively with sap harvested during the first days of the run (only the sap harvested during the first 3 days), rare Escuminac light is an exceptional syrup with a smooth, velvety texture. It is light in the mouth, featuring a subtle caramel and honeysuckle bouquet with a hint of cinnamon and a lingering flavour. Canada Category A maple syrup with an amber rich taste. Tasting Notes: Escuminac Extra rare maple syrup is produced in very small quantities, making it rare. Golden in colour with bright highlights, it is the finest in our range. Produced exclusively with sap harvested during the first days of the run (only the sap harvested during the first 3 days), rare Escuminac light is an exceptional syrup with a smooth, velvety texture. It is light in the mouth, featuring a subtle caramel and honeysuckle bouquet with a hint of cinnamon and a lingering flavour. Storage: 3 years in a cellar - 6 to 12 months once opened – keep refrigerated for quality. Method: In Spring, at the thaw, when the wood of the maple trees swells and temperatures in the daytime are positive (+10°C) and negative at night, conditions are ideal to begin the harvest. During this short period, the maple sap begins to flow. The harvested sap must be boiled on the same day. Heating at a constant high heat has to be mastered by the maple syrup producer. Slowly, the water contained in the sap evaporates, the sugars are gently concentrated. Following a complex sequence of chemical reactions, when the syrup reaches a temperature of 104°C and 66°Brix, the sap becomes maple syrup (pH 7). Produced and bottled at the ESCUMINAC sugarwood. but decreasing supply to manufacture rareness does not mean something deserves a higher price. ive ingested a LOT of maple syrup and i can tell you straight, the sap from the beginning of the year may make lighter syrup on a statistically fine basis- but that is no guarantee of high taste quality. basically, you are paying extra for syrup that is extra light or light. which appeals to some people sure. syrup is considered syrup when it has a certain sugar content. no matter the grade, its all the same my dudes. the lighter stuff just has less maple flavour bacteria, to simplify it. the crud they tell you about honeysuckle and bluh aftertaste? the same scam as wine snobs. its maple. if it tastes like something else? thats a problem! maple syrup is an incredibly simple majigger. by all means, store permeable vats of it next to vanilla. drop a nutmeg into every jug. but list that on the ingredients or im calling contamination. Better than many other brands but lacking a little in richness of taste for my liking (compared to another organic amber syrup). My grandfather made maple syrup, so I grew up with it. This is the best I've tasted since being a kid. It's not as sweet as most are now days and the maple flavour is wonderful. My family members love it too. I've purchased a total of three bottles to date and hope this will continue to be available here. If it came in a larger bottle, I would be happy to purchase it. Only maple syrup hits my table. By far the best maple syrup I've ever tasted. You want this straight off the spoon or used as a topping because the flavour is that good you wouldn't want to miss it mixed into something. Extraordinary Syrup !